Come and hone your photography skills in beautiful Whitstable, with an expert team who’ll help take your pictures to the next level. You’ll get hands-on instruction and a wealth of expertise from styling, to prop sourcing, editing, social media and lighting. Enjoy a fun and relaxed day with great food and company, and come away with your photography invigorated. Anyone with a camera and a laptop who wants to improve their photography! Small businesses who want to up their photography game, creatives who’d like to explore their passion, everyone from bloggers to novices looking for a new hobby to enjoy will come away with renewed confidence and skills. You’ll learn from three industry professionals: Times-featured photographer, Karuna Clayton, Camilla Wordie, food stylist, and Holly Farrier, lightroom specialist and social media expert. At the end of the day you’ll find your skills honed, your understanding sharpened and your photography improved. Lots of opportunity for practical, one-on-one help and advice from our skilled coaches, throughout the day and during shooting. Enjoy a relaxed, informal and fun day – the best possible environment for learning! This workshop goes so much deeper than just photography skills. Come and learn the “whole package” and walk away inspired on how to present your brand, product, yourself or your art. With a new henhouse, run and tiny flock of two to show off, I'm happy to hold personal day courses for two or three students on a date of your choice at my house in Whitstable - a jolly place to spend the day or weekend (we can recommend B&Bs and places to eat). 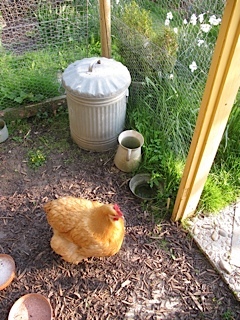 So get together with a friend and emailfrancine@kitchen-garden-hens.co.uk for details. Trains from Victoria or St Pancreas - we can pick up from the station. 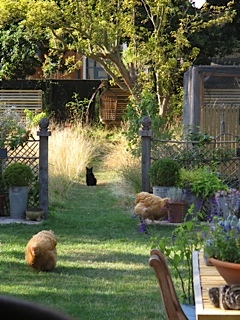 Spend a day with me here at my new house in Whitstable and learn all there is to know about keeping hens: with hands-on advice, practical tips on how to garden despite your hens, and a fabulous slide show. Sit round the kitchen table and discover tempting recipes for all those delicious eggs, topped off with lunch and a glass of wine. The intimate nature of these teaching days among friends means that your personal henkeeping problems can be resolved taking your own situation into account. Take home a goody bag of useful information and enjoy a day out at the seaside at the same time. Post dated cheque payment in full on booking please. Refunds (minus £20.00 admin charge) offered for cancellations within a month of the course date, but we suggest if you can’t make it you try to find a friend to take your place. If we have to cancel, you will of course get a full refund. 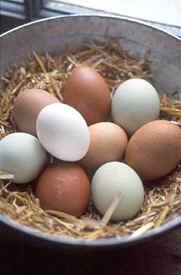 The Kitchen Garden has joined forces with My Garden School to produce an online henkeeping course. A boon for those who can't travel to our day courses.